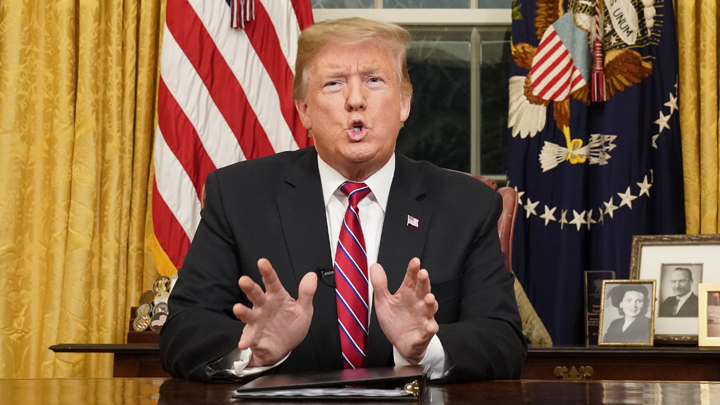 US President Donald Trump spoke this night with a televised address to the Americans about the situation on the border with Mexico. He announced that the security crisis due to the ongoing illegal migration that goes hand in hand with crime and drug trafficking is growing, and only the construction of the Wall between the two countries can solve it. The owner of the White House expressed the hope that in the near future he would be able to agree with the Democrats on the allocation of about six billion dollars for the implementation of this project, after which he would approve the budget and the federal government would be able to resume work suspended on December 22. It is hard to deny that the “escalating humanitarian and security crisis” on the southern border of the United States is not trump’s invention, and it’s true. Over the past few months, over 60,000 people have attempted to illegally penetrate from Mexico into the United States, several “refugee caravans” from all of Central America settled near a joint-border sieve, and several more approached it. Despite the fact that in this area - in addition to the border guards - the United States deployed as many troops as in Afghanistan, the "refugees" are trying to storm the border and find opportunities to penetrate it. The situation is critical: Every day, customs and border guards face thousands of illegal immigrants trying to get into the country. All this has given rise to a “cycle of suffering” and violence, which must be stopped. Trump pointed out that criminals, often using women and children as cover for them, flood the USA across the southern border with drugs (this is 90% of drug traffic), which will kill more Americans in 2019 than during the entire Vietnam War. In the same way, killers and rapists infiltrate the country. Trump gave several examples of the brutal murders committed by illegal migrants. The construction of a protective barrier on the long border with Mexico, which is difficult to control using conventional methods, says Trump, is "just common sense." Including thanks to the excellent new trade deal between the USA, Mexico and Canada. According to Trump, a way out of the crisis associated with the Democrats' refusal to support the president’s position in Congress can be found “in 45 minutes,” for which he invited leading congressmen to the White House on Wednesday. The US president expressed the hope that lawmakers would be able to “rise above inter-party differences” in order to overcome the crisis. Reiterating that the Wall is “critically important to the security of our borders,” the president said that the Barrier would be made of steel rather than concrete. Trump warned that the work of the federal government would remain suspended for one reason - the failure of the Democrats to finance the construction. Immediately after the presidential address, broadcast by all American television channels, the speaker of the House of Representatives Nancy Pelosi and the leader of the democratic minority in the Senate, Chuck Schumer, responded. Both called on Trump to immediately restore the work of the government, put an end to the crisis and “stop keeping the American people hostage” of their short-sighted policies. "The symbol of America should be the Statue of Liberty, and not the Wall at the border," concluded Schumer. So, as we see, Pelosi and Schumer were completely deaf to Trump's argument and are not going to give in to him. They are convinced that Trump himself must give up, since it was he who finally decided to receive money from Congress to fulfill his promise to build the Wall. Democrats intend to use their control over the House of Representatives in order to paralyze the Trump administration, and to impeach him himself or get rid of him under the threat of impeachment. To this end, in the lower house of Congress renewed investigation of possible sins of Trump and his entourage. To do this, special prosecutor Robert Muller is trying to overlap Trump from all sides. He “drowns” the president not only on the instructions of the “Deep State”, but also because he has personal motives for this. Democrats believe that now Trump is in their hands, so, again, they absolutely do not intend to give him the issue of building the Wall. Among other things, this issue is of fundamental importance for them, since the Wall is the obvious antithesis of the Open Society they preach, and illegal migrants are an excellent means of weakening national states in the name of the coming power of world government. In tactical terms, this is the source of cheap labor and potential voters of the Democratic Party. As, by the way, the security threat necessary to introduce once a total police state under the pretext of fighting crime in the interests of supposedly the whole of society, but above all the globalist leaders, who really don’t need any real democracy. So that people would accept the fact that 1% of the population has almost as much wealth in their hands as all the rest, and the latter would not try to change this situation by voting for “populists” in the elections. Democrats love illegal migrants disinterested. They actually just use them. Trump will not win the confrontation with the Democrats associated with the Wall and the Shutdown also because he does not enjoy the unanimous support of the Republicans on the Capitol, among whom there are also quite a few adepts of the Deep State. Therefore, we have to admit that the President of the United States seems to have made a serious mistake. He will lose. It is he who will have to “lose face” and sign a budget without a Wall since the president bears the main responsibility for the state of affairs in the country, and officials will not be able to live long without a salary. And this expected failure will only inspire his Democratic critics and the Republicans dissatisfied with them to tighten the “straitjacket” on Trump stronger or get rid of him as soon as possible. For this, everything is ready.